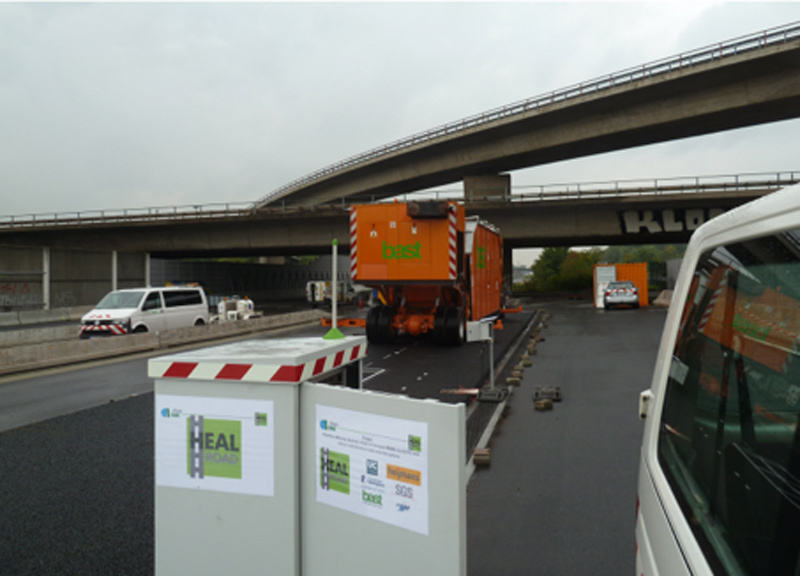 On October 9th 2017, the BASt Mobile Load Simulator MLS30 was prepared for the loading of the HEALROAD test track. The operation takes place at the new duraBASt facility in Cologne (Germany). 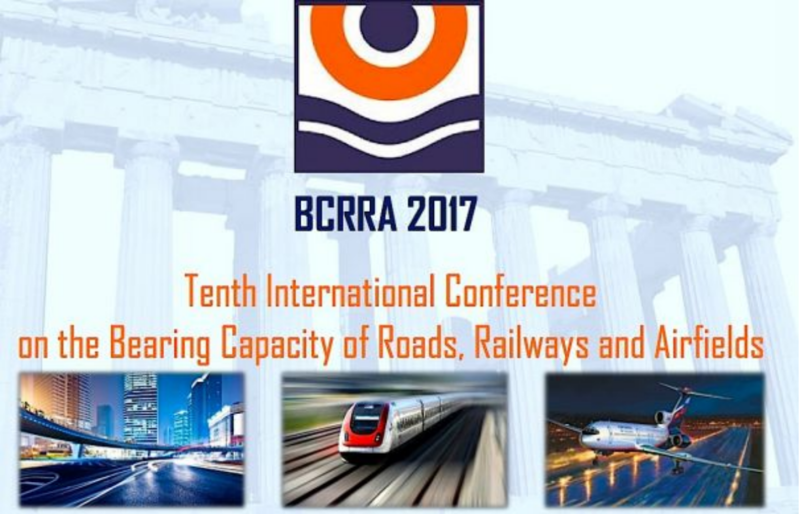 The parameters of the MLS30 were changed for the wheel load (now 75kN), and for the tyre pressure of the four loading wheels to 9bar. The MLS30 machine operates through lateral moves in order to change the loading line during the experiment. Concretely, the machine is planning to move +/-350mm left and right. Total duration of the test is around 12 minutes (center – right – center – left – center). The loading frequency is around 2000 loading cycles per hour. The loading programme will run until the end of October for the first section, and mid November for the second. The main goal will be to lose stones from the surface and get a feeling on the first test section (HR1). 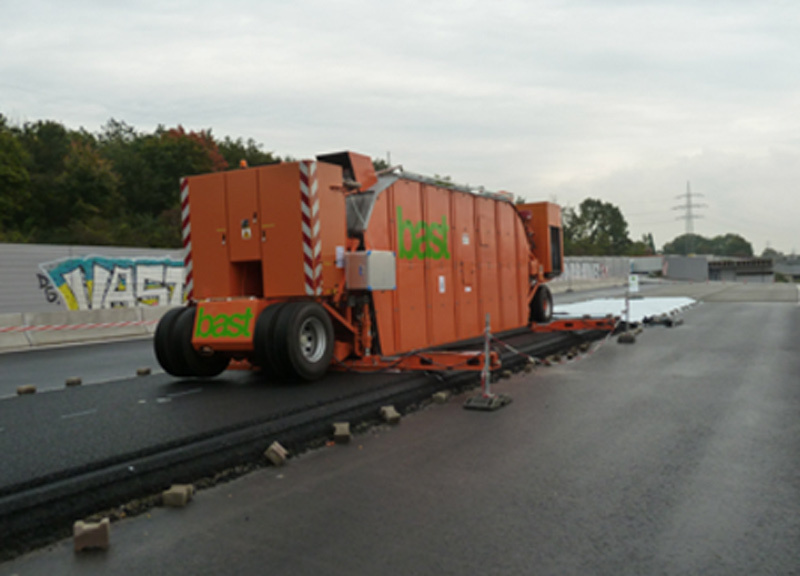 During the loading test on the second section (HR2), the recovery of the asphalt will get supported by induction energy to heat up the HEALROAD solution. Due to this recovery, the stone lose is expected to be changed in comparison to the first test section.